In January this year I drove a Nissan Leaf from London to Edinburgh. This was partly in response to an attempt by BBC reporter Brian Milligan to undertake the same journey 3 years previously and partly because we knew we could do it. It took us 11 hours, with never more than a 20 minute wait to charge the car. I’m not going to claim it was a walk in the park, it was January, cold, wet and dark for most of the journey and it was also quite boring. Driving long distances is boring and bad for you, I try and do it as little as possible. Which is why, writing this in a motorway service area after a long drive while I wait for the extraordinary electric car I've been loaned to charge is a little bit bonkers. Today I am driving from the South of England, my home in Gloucestershire, to Edinburgh, a distance of 341 miles. However this time I only need to stop a couple of times. less than an hour to bring the batteries back to full before commencing the second leg of the journey. A few people have already commented on the appalling parking on display in the picture, it was a little bit tight and the Tesla is a huge beast, okay, I am rubbish at parking. 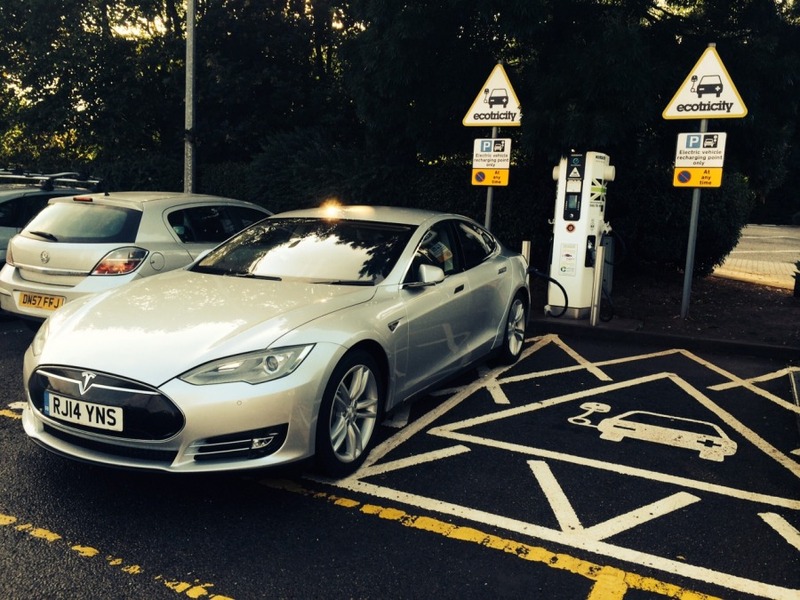 The range of the Tesla Model S, on a UK motorway, at motorway speed is well over 250 miles on a charge so it really takes driving an electric car into another dimension. In the Nissan Leaf in January we stopped 7 times on our trip to Edinburgh. We never got close to being empty and we only charged for 20 minutes but that’s still 7 stops. Just to explain a little. The battery pack in the Nissan Leaf is 24 kiloWatt hours. In the Tesla Model s, it's 85 kiloWatt hours, so even with my crude grasp of maths, I can understand why it goes further. So today I have overstopped, but that is not because of the car's range. Let’s forget the range and the rapid chargers and the battery for a moment and think about my bladder. Sorry, but my bladder has a range of about 95 - 120 miles, I will be stopping a little more often than the car needs to for my own personal reasons. So why, after I stated publicly last time I did this trip that in future I'd get the train, am I driving all this way again? Hopefully it’s an informative and entertaining talk, I certainly enjoy doing it. I’m doing the talk at the Assembly Rooms in George Street, Edinburgh, it's part of a season of talks given by very prominent scientists and academics.... and me. All day tomorrow the right hand drive Tesla Model S will be on display for a day outside the vehue. But here’s a romantic little bit of history that has nothing to do with electric cars or the future of the energy matrix. I’m presenting this talk in the very same theatre I first saw my wife performing in 27 years ago. She was then an acrobat and performer in Circus Oz. Just in case you are wondering if we are on this trip together in a romantic re-hash of our early love... um... no. She's at home, working on her masters degree and walking the dogs. 27 years later. Hey ho.